This vacation penthouse in Fort Myers, Bay View Tower 1131, is a great family vacation rental. Particularly well suited for up to a three generation family vacation or for two couples traveling together, this penthouse will more than meet your needs. This condo offers 2 king bedrooms, each with its own bathroom. The third bedroom is equipped with two twin beds and an adjacent bathroom. The loft king bedroom has a separate sitting area with a sleeper sofa and amazing views of the gulf. This condo sleeps 8. It may be booked online or you may call for assistance. The tropical inspired décor is fun and the views from the screened in balcony include the beach and the islands of San Carlos Bay. 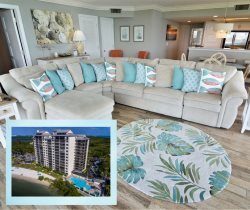 Enjoy the stunning sunsets from the lanai or take in the sun on the beach or at the pool directly below. This penthouse has free 5G Wifi and no telephone service available. You may have found this rental on HomeAway #4808383 , VRBO #4808383ha or Vacation Rentals #4808383. I stopped by the office once and the staff was very friendly and welcoming. They answered my question as best they could and offered for me to come back should I require anything else. This is our 3rd time staying at the Resort Harbour Properties. This time, we stayed in the Bay Biew tower in Unit 1131. It was perfect for our family of 4 and could have accommodated more. But everyone was happy to have their own space. The views are beautiful. The unit was clean and provided all that we needed as far as cooking, cleaning up after ourselves, and relaxing. I worked while we were there so I was happy to to connect to the free WiFi though my kids claimed it was a little weak. The resort grounds are clean and well kept. The elevator is quite slow but it works. It would be nice to have an 11am checkout time but we understand that they need to get it cleaned for the next renter so we didnt even ask for the time. Wed definitely stay here again and especially in this unit. Everyone we encountered was very friendly, helpful, professional and knowledgeable! Our stay was fantastic, we had an amazing time.....was fun to cook in, was fun to go out to eat, we enjoyed the pool and the beach. Access to the beautiful walking path was a great way to start our day! Everyone was friendly and welcoming! We loved our beautiful condo and all the room we had....we didn't feel like we were on top of each other, slept great, the view is amazing from the 11th floor, the pool was wonderful, gorgeous beach....it was all perfect! Thanks for a great stay! Can't wait to come back! Excellent stay , condo exceeded expectations all needs were met, staff on property accomadating and friendly! Katie was very helpful and extremely nice each time I called with questions or when I needed directions. The apartment is very well kept, clean, and just like the photos online. We were 7 adults and 2 children and there was plenty of room for all of us. We had such a great time during our Memorial Day weekend stay. In fact, we are already planning on going back very soon!